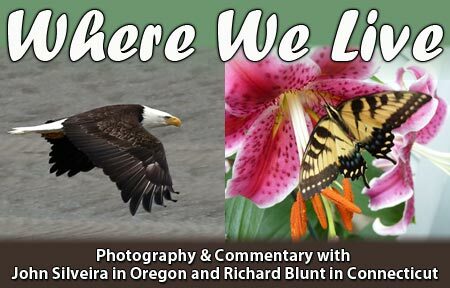 I’ve been talking about what takes place on the north bank of the Rogue River, just outside of Gold Beach, what with the elk and other animals. I’ve even mentioned and provided photos of a candy store a mile or so from Highway 101. These are all things the tourists usually miss. 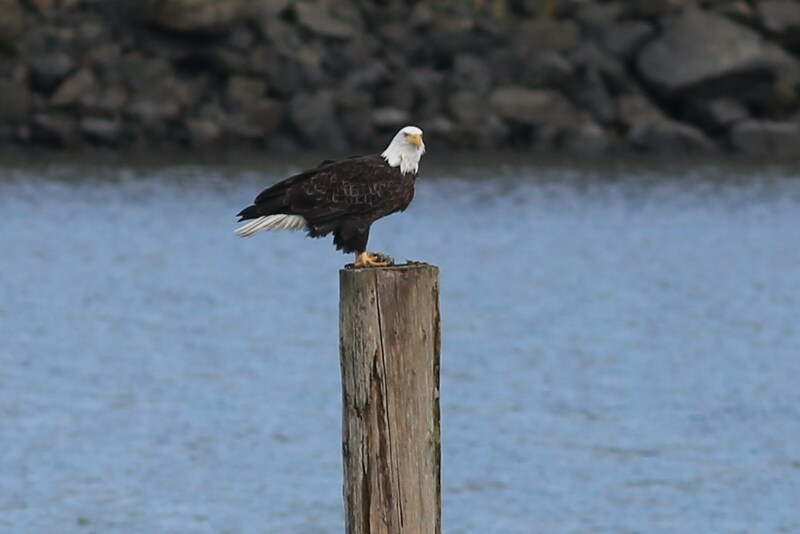 However, today I’m going to talk about what’s happening in the Port of Gold Beach. Most of the tourists miss this, too. This time of year, with the fisherman largely gone, the harbor seals are back in the port and will be here until spring. 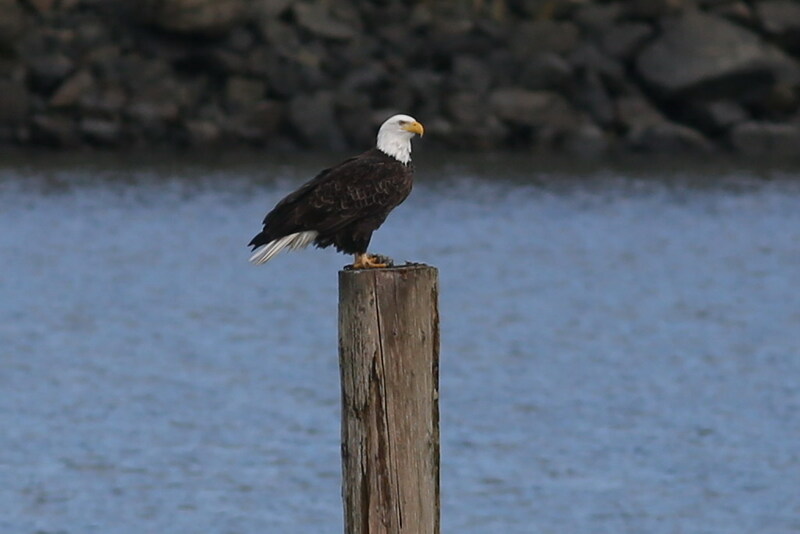 But what’s also back are the bald eagles. Well, one eagle, anyway. I have a friend, Earl Yager, who lets me know when there’s one down in the port. 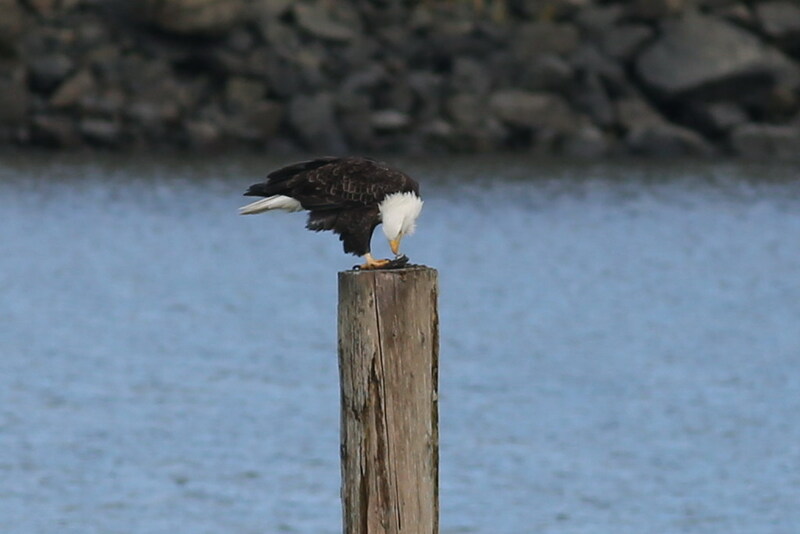 It has apparently marked off one of the wooden pilings in the port as its own, and it goes there to eat in the morning. 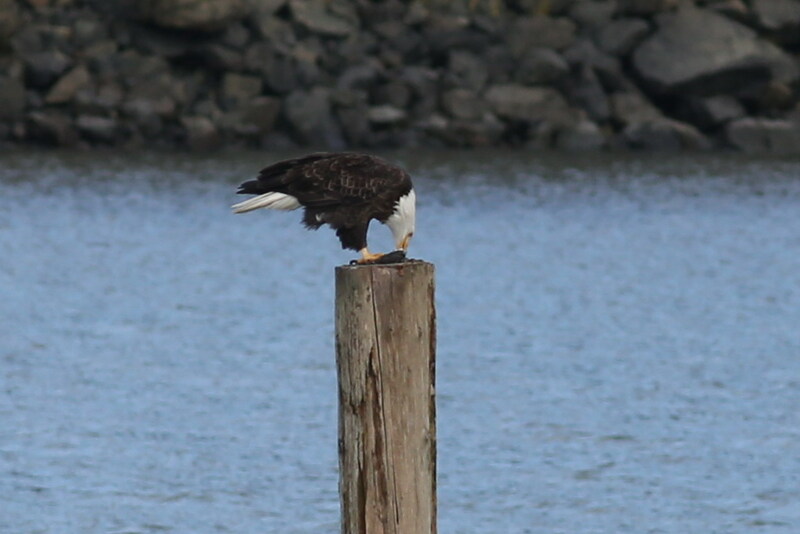 I don’t know where it finds what it’s eating when it’s sitting atop this piling, and I can’t blow my photos up any further to be able to tell for certain what it was eating on this particular moring, but Earl tells me there are times the resident seagulls harass the eagle while it’s up there. My guess is that it’s not so much that they see the eagle as a threat as it is that they hope to drive it off whatever it’s eating, or make it drop it, so they can get a free meal. I’ve seen them harass ospreys and even each other in the same way. 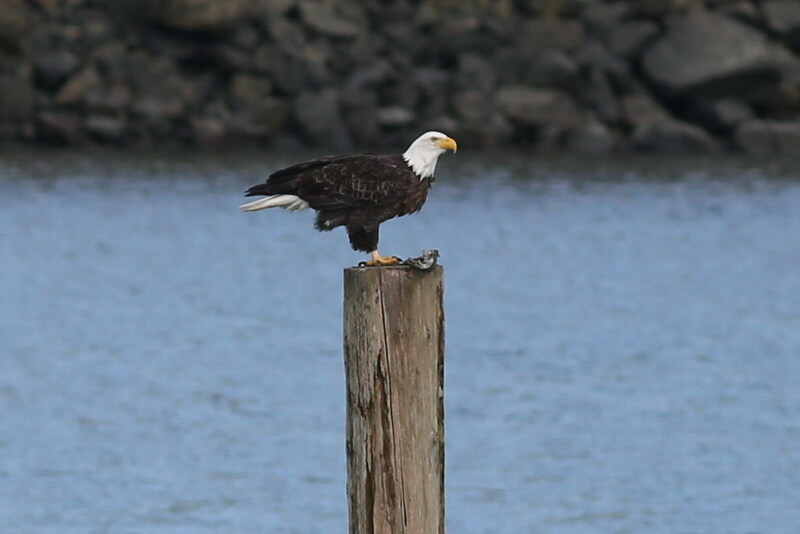 Anyway, these eagles, as well as the seals, sea lions, and other wildlife in the port, are more things the tourists miss when they blow through town. However, if you stop here for even a rest stop, you’re likely to see things you’re not going to see in LA, San Francisco, or wherever it is you come from. And if you eat at on of the portside restaurants, like the Port Hole, and request a window seat, you might get a show while you have dinner. 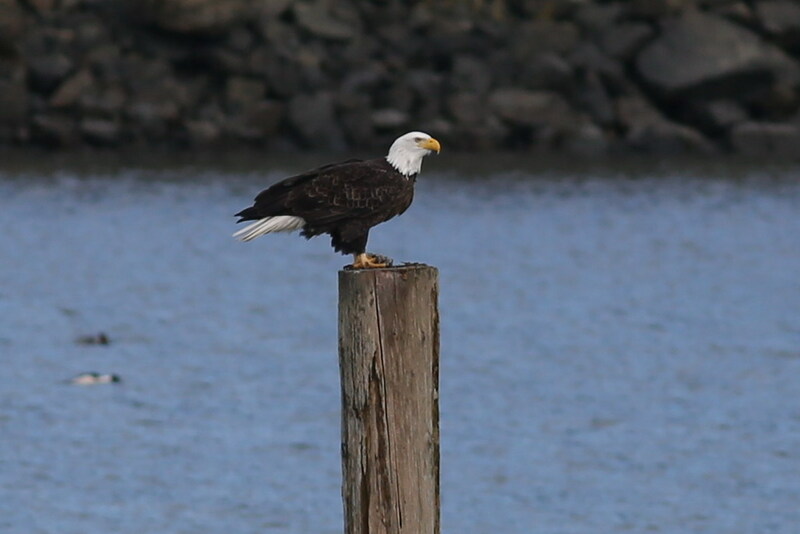 All of the photos were taken with my Canon 5D Mark III using my Canon EF 400mm f/5.6 L USM prime lens. 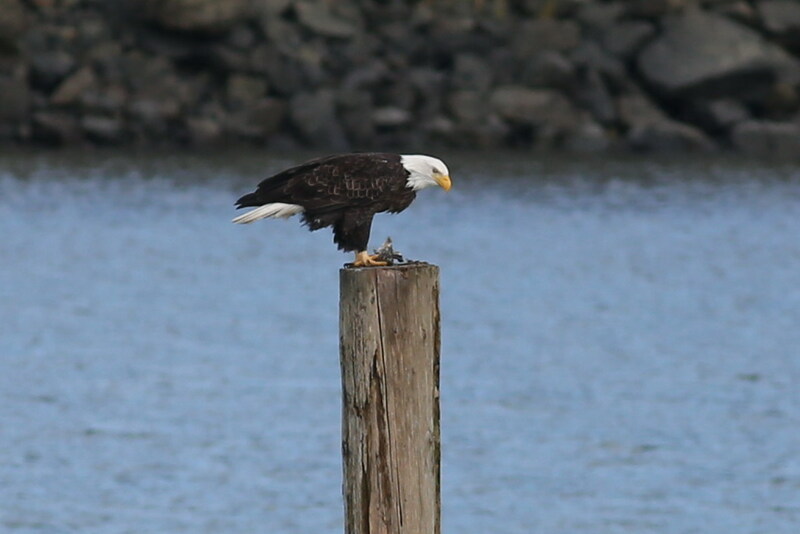 Because of the distance — at least 200 yards — I set the camera up on my tripod. The 1/1000 of a second shutter speed does a lot to reduce camera shake, but it was windy, I was shivering, and it was a long distance, so I wanted to make the camera as steady as possible. I’d have used a time delay or my remote but with the wind, I needed my hand on the camera to keep it steady, anyway. Don’t forget to click on the photos so you can see them enlarged. This is as much as I can blow these photos up without losing resolution. But, blown up, I still can’t tell quite what it is the bird was eating. But it clearly looks like some kind of fish. It had probably noticed me before. But here it’s finally taking a timeout, apparently to take a good long hard look at what I’m doing. I threw this one in because it just makes the bird look so regal. Ditto here. And you can see, whatever it was eating, it’s about gone. 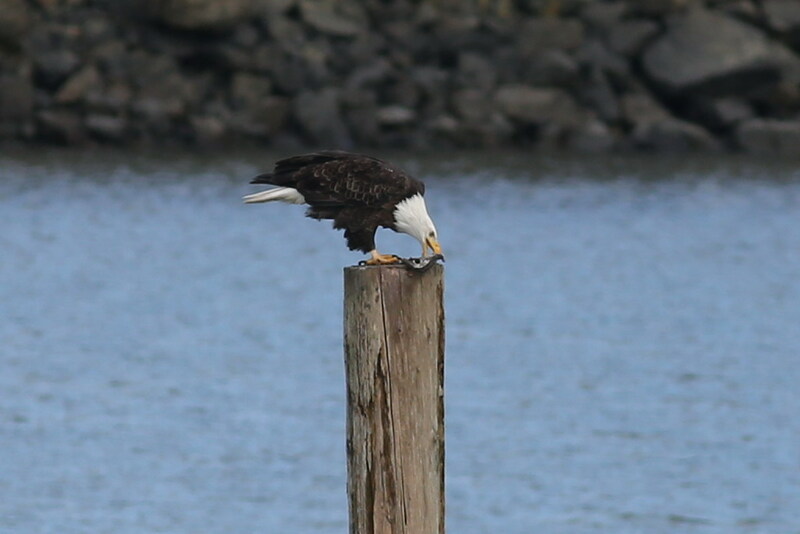 Now, I’m off to the port to see if the eagle is back. 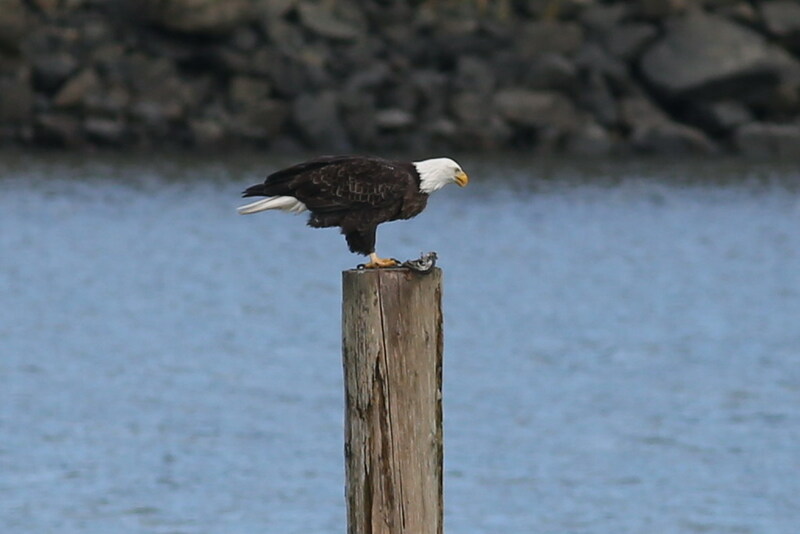 This entry was posted on Saturday, January 5th, 2013 at 12:27 pm	and is filed under Bald eagles. You can follow any responses to this entry through the RSS 2.0 feed. Both comments and pings are currently closed.